After a weekend of freaking out (me) and months of preparation (them), we finally have a new Doctor. The 12th Doctor, to be exact. And he’s nothing like the Eleventh Doctor who came before him. After months of speculation, the wait to find out who will be named as the Twelfth Doctor on BBC’s brilliant Doctor Who is almost over. At 7pm UK time this Sunday, the 4th of August (that’s around 4am Monday morning for us), a live broadcast will go to air on the BBC where Matt Smith and Steven Moffat will introduce the new Doctor. Please Moffat, I’m trying to trust you here, but seriously you have fifty years of brilliance in your hands, don’t stuff it up because the power’s gone to your head. I am not a wrestling fan, but my brother watches the Fox8 broadcast numerous times a week, and so I was assigned chaperone for the 2013 WWE Live Tour Melbourne show. Over the years, I have picked up some of the wrestler’s names; Hornswoggle and John Cena are definite stand out stars in my home. But outside of them, the obviously named Big Show, and the eternally creepy Undertaker, the WWE is a confusing mix of muscly men and sexualised women with similar sounding stage names. Just don’t let my brother hear you saying that. 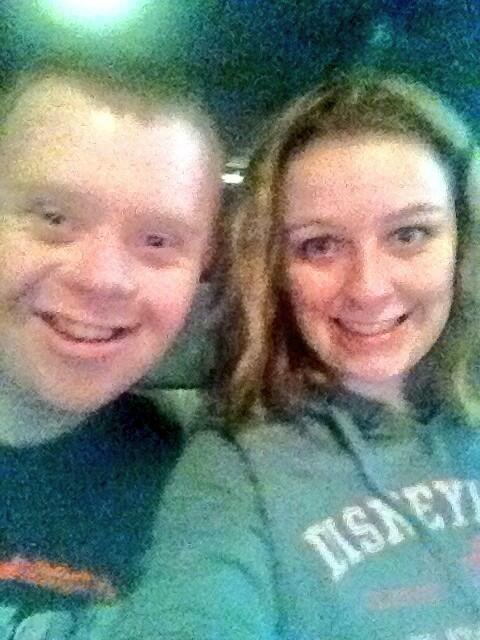 My brother, the WWE’s biggest Superfan, can tell you almost every wrestler’s name, height, weight, and hometown. He knows the wrestlers who have fathers in the Hall Of Fame, and what titles each wrestler has held. Obviously obsessive fan behaviour runs in my family. The very first time I watched The OC, I fell deeply in love with Seth Cohen. Unlike Ryan and a million other teenaged male main characters of TV shows, Seth was awkward, self-deprecating, nerdy, and absolutely perfect. I have spent my teen years searching for my very own Seth Cohen (unsuccessfully, to this point, but if you know someone who fits the bill let me know), because let’s face it, he would be the best boyfriend ever. Vancouver police have confirmed that Glee Star Cory Monteith has died of a suspected drug overdose. Steph and I attended Supanova Sydney last weekend, and we made it our aim to sit down and chat to someone from the Merlin cast. Because we’re amazingly awesome, we got to grab the Knights of the Round Table, aka Sir Gwaine (Eoin Macken), Sir Percival (Tom Hopper), and Sir Leon (Rupert Young), for a quick chat (with a lot of emphasis on the quick) before they left the convention. I have recently begun to watch Hannibal, the relatively new American television show about Hannibal Lecter. Not one for the faint of heart (or weak of stomach), Hannibal is delightfully creepy. The basic premise is this: Will Graham (Hugh Dancy), is a young behavioural analyst for the FBI. He has the uncanny ability to get inside the head (“the design”) of serial killers, due to the intense levels of empathy he experiences. Jack Crawford (Laurence Fishburne), the head of Behavioural Science Unit at the FBI enlists him to help track down murderers. To help out (and to help keep an eye on Will), he also enlists psychiatrist Hannibal Lecter (Mads Mikkelsen). Matt Smith was my first Doctor. As much as I want to deny it, it’s the truth. Coming very late to the game in 2011, my first experience of Doctor Who was watching Matt Smith in The Time Of Angels. I then went back to the beginning, and after watching the brilliance of Christopher Eccleston and David Tennant, began to call David “MY” Doctor and never looked back. It was announced this morning that Matt Smith is leaving Doctor Who with this year’s Christmas Special. This is the first time since I began watching the series that there will be a regeneration (as opposed to me belatedly watching them), and yet, I just feel relieved. Season Seven of Doctor Who has been…disappointing to say the least. In fact, I let myself fall behind by five episodes, and only caught them up this week, as I Just Didn’t Care. I was looking forward to the finale, “The Name Of The Doctor”, but in a “prepare the lynch mob, we’re going after Moffat” kind of way. There were so, so many ways the episode could go wrong, and it surprised me immensely by going so very right. If you haven’t seen the episode and don’t want to be spoiled, STOP READING HERE. In order for me to best express my feelings towards the episode, I’m going to break it down for you. I suppose I haven’t really had time to form an attachment to Clara. I loved her in Asylum Of The Daleks…but her mystery and sense of impossibility annoyed me more than it made me love her. Even though I knew she survived the episode, part of me was hoping that she would die, for real this time. We didn’t get her (permanent) death, but we did get answers. As Clara best puts it, “the soufflé isn’t the soufflé, the soufflé is the recipe”. The question isn’t who, or what, Clara is, it’s what she had to do to save The Doctor. Clara is simply Clara Oswald, the girl from 2013 London, but her heroic actions, sacrifice, and reminder to “run, you clever boy, and remember me”, make her a permanent fixture throughout his life. On one hand, I think the answers were pretty awesome. While the whole Great Intelligence story line seemed…stupid, Clara’s actions perfectly – and dare I say it, almost rationally – explained how she could keep appearing in the Doctor’s timeline. My one big problem is…what’s her point now. She’s no longer the impossible girl, and I’m still not loving her as A Character, let alone as A Companion, so I’m worried season eight could become painful. I was really hoping that we’d seen the last of River in the Seven Part One finale. Although I found her character likeable enough in her original “Silence In The Library” episodes, I thoroughly disliked the rest of her appearances. As for the season six story arc…don’t even get me started. Prior to watching the finale, I was happy for River to stay on a hard-drive in the library, where she belongs. Don’t get me wrong. The finale did not make me suddenly fall in love with River Song, but it was such a heartbreaking appearance that made even me, a diehard Ten/Rose shipper, admit that Eleven had moved on and truly loved her. Now. I still feel he was way, way overly attached to her, but this was deserved closure. The River we saw in this episode was not the River we had grown to hate throughout seasons six and seven (okay, personal bias, but still) but rather the Saved “echo” of River from season four. The pain that radiated from the episode came from the fact that it was a final goodbye for the pair, and that for the first time, Eleven acknowledged her sacrifice and current “existence”. As much as I thought I wanted to see her gone, this kind of goodbye tugged at even my heartstrings. As much as I hate Moffat, I have to admit that he comes up with some frankly terrifying monsters. The Whisper Men were definitely not an exception. A creation of the Great Intelligence, the feature-less bodies with their horrific teeth are more than enough to make me think twice about any whispers I hear from now on. While they were destroyed with the Great Intelligence’s demise, I’m sure they’ll be making lists of the “Scariest Doctor Who Monsters Of All Time” from now on. Eleven is my least favourite Doctor, partly because I’m still not over Ten’s regeneration, but mostly because he completely avoids all the emotion that made the previous Doctors so powerful. In the finale, the only word to accurately describe him was broken. For the first time, Matt Smith was able to express his brilliant abilities to portray pure pain and heartbreak for the length of an episode. Aside from the first…minute in which we see The Doctor, one glance at him throughout the finale reflects the pain of his 900 years of grief. I was mildly annoyed at the pain that came from his feelings towards River Song (okay, okay, I’m trying to get over my Ten/Rose bias, I promise), but the pain that came from being at his tomb, along with all it entails, was flailingly fabulous. It was like he had removed his playful mask that had been so firmly in place for the previous three seasons, and finally allowed his true feelings to show. It was obvious this was not new pain, it was just a pain finally, and gratefully, revealed. As a side note, I will admit that when we looked into his timeline/scar/map/whatever and heard the voices of his past, I literally screamed when I heard Chris and David. Yes, I am that kind of fan, and yes, I am deeply unapologetic. The final minutes of the episode, where Eleven sees this forgotten ninth reincarnation, can only be described as perfection. I don’t want to quote it for you, because you need to experience it for yourself to truly understand the majesty and importance of what is occurring. When I read a few weeks ago that John Hurt was joining the cast as (allegedly) “the forgotten ninth doctor”, I freaked out. I loudly announced to everyone who could hear (my roommate, the internet, my college friends, my media class) that this time Moffat has gone too far and this is an absolute unforgivable and nope nope nope. Then, in the final minutes of the finale, I proved myself so very wrong by instantly falling in love with this new incarnation. While I am still Very Annoyed at Moffat for throwing in this new “Doctor”, I have to admit that I am looking forward to seeing where the story will go. It’s a breath of fresh air – albeit one that Moffat didn’t really have the right to create – that will hopefully inject some much needed life into the increasingly stale series. It’s almost a life or death situation for Moffat, if this gamble goes right, faith across the world (well, fandom) will be restored in his show-running. If it goes wrong…well…he’ll have the wrath of the Whovians to face. If, like me, you had just about Given Up on Doctor Who, I promise sticking through for the finale, if you haven’t already, will be worth it. It’s a brilliant ending to a sub-par season, and opens so many doors for hopefully amazing future endeavours. To be honest though, I’m just ecstatic we didn’t actually find out The Name Of The Doctor. Maybe Moffat isn’t all bad after all. Doctor Who returns in the 50th Anniversary Special (!! ), starring my beloved David Tennant, on the 23rd of November 2013. Doctor Who Season Seven Episode 13, “The Name Of The Doctor”, will be available for a limited time on ABC iView in Australia, and on the Season Seven Part Two DVD worldwide. 2013 is a big year for Doctor Who, being the 50th Anniversary of it’s creation in 1963. It also brings the second half of season seven, and the first with a new companion in three years. The 50th Anniversary special is shaping up to be a massive deal. Expected to air in November, the special will include more than just current Doctor Matt Smith. In fact, late last week it was revealed that all time fan-favourites David Tennant (10th Doctor) and Billie Piper (Rose) will make appearances in the episode. Despite entering the fandom in the Matt Smith era, David Tennant will always be my Doctor. Sometimes I cry thinking about his regeneration, and no matter how hard Moffat has tried to introduce new love interests, nothing will ever be greater than the love between Rose and Ten. Nothing. To see them back is a dream come true, and the way the fandom rejoiced when it was announced goes to show that sometimes, just sometimes, Moffat is capable of making good decisions when it comes to Doctor Who. 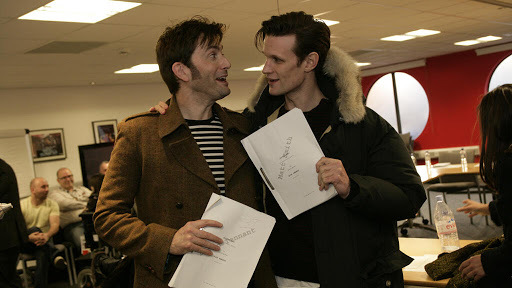 This morning, The BBC Doctor Who official twitter tweeted that the first read-through for the 50th Special had been completed, and included a photo of David and Matt holding their scripts. Be still my fangirl heart! The second half of Season Seven began on Sunday. We left the first half last year with “The Angels Take Manhattan”, the heartbreaking finale to the Pond companionship. The Christmas Special, “The Snowmen”, saw a return to new companion Clara Oswin Oswald, who we first met in the season seven opener, “The Asylum Of The Daleks”. And now, as we enter episode six of season seven, Clara’s back for good. Clara, played by Jenna-Louise Coleman, is an enigma of a character. Like River Song before her, we’re not entirely sure of who she is, or why the Doctor has been drawn to her. After three episodes in three different time periods, with three different personalities, I’m still not sure what I think of her. My heart will always belong to Rose and Donna, so Clara has a lot to prove if she’s going to make my “most loved” list. In the new episode, “The Bells Of Saint John”, which is available for Aussie fans who missed it’s television premiere to watch on iview, the Doctor’s quest to find Clara takes him to London in 2013. And there’s something in the wi-fi. I heard amazing things about the episode before I watched it, so went in with high expectations. It was good, don’t get me wrong, but it wasn’t brilliant. The best bit was that it was (almost – the Great Intelligence seems to be a recurring theme) entirely stand-alone, like the good old days, so we can tune in next week expecting new aliens and new adventures to be had. For many Doctor Who fans, 2013 is a kind of last chance. 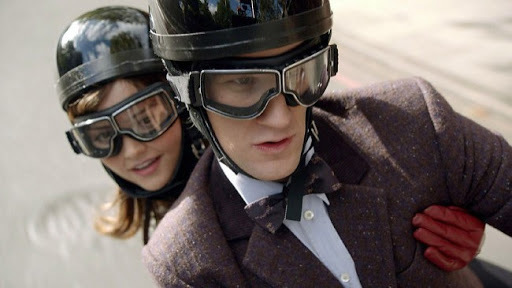 For fans of Nine and Ten, Eleven has been dragging, ruining past rules and ignoring continuity. The Pond storyline went on, and on, and on, and please don’t get the fandom started on River Song. But here we are, with a new companion, a permanently changed Doctor, and a chance to start afresh. The 50th Anniversary will allow us to see some old favourites (something not often possible in Doctor Who, especially since Eleven came onto the scene), and all in all, it’s going to be rather epic. If you haven’t been watching, a new companion is often a good chance to fall in love with the brilliant show, and there’s no better time than the anniversary year!